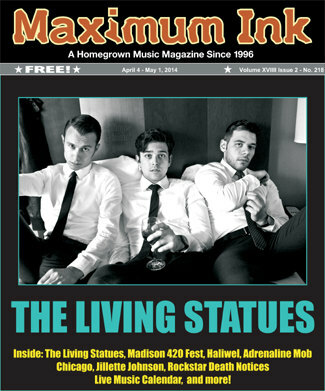 Melding a classic garage sound with British Invasion hooks and the straight-up timeless rock n’ roll fashion sense, Milwaukee’s THE LIVING STATUES have been blazing a trail through the Midwest like a hot rod since their formation in 2012. Their first EP, Knockin’, is released on Tuesday April 8th. We took a few minutes to talk to Tommy Shears (guitarist and lead vocals), Chris Morales (drums and vocals), and Alex Thornburg (bass and vocals) about how the group got together, excitement over their new release, and their near-future plans. Maximum Ink: What’s the story behind you guys getting together? Chris: Growing up, we all played in different bands that matured us as musicians and informed our style. TLS started with Tommy and I as a guitar/drums two-piece, but when Alex joined on bass, we knew we had something special. Tom: The Beatles and Elvis. What else is there? Chris: Michael Jackson, Prince, Lenny Kravitz. MI: Who were the bands that you guys gelled on as musicians? Alex: Collectively, we’re big fans of The Strokes, The White Stripes, Arctic Monkeys, The Killers, The Hives, Kings of Leon…these are the guys that shaped the genesis of the Statues. MI: What was the thing that struck you the most about rock n’ roll that made you wanna do it? MI: What inspired the band’s name? Tommy: Statues are built as memorials to great individuals of the past— war heroes, presidents, coaches and authors… all people who live on past their death. We each want that kind of glory for ourselves. As statues, we hope to inspire people with our music long after we’re gone, but right now while alive we’re The Living Statues. Alex: If we had to choose one song from the EP for first-time listeners, “Extra Day” is definitely the one worth spinning. Tommy: It’s a song about missed opportunities and telling yourself that things would be different if you had only one more day to prepare. Chris: It’s perfect for new listeners because it’s a punchy and one of the catchiest songs we’ve written to date. MI: What’s the story behind the title? MI: What song do you think best represents the band’s vision? Alex: “Time For Me To Go” is the song that best represents our collective vision. It was the most collaborative song on the EP and best showcases our modern take on a vintage rock-n-roll sound. Chris: Opening for The Vaccines at the Majestic Theater is definitely at the top of the list. For one, we are big fans of their music. It was cool to hang out with those guys & grab a few brews with them after the show. Secondly, there was a last minute equipment mishap, and the band had to grab our amps before going on. The most memorable part of the show though was the audience and their energy. It’s always amazing to see a crowd of pretty girls singing the words to our songs…it’s a feeling that never gets old. Tommy: We just booked a Daytrotter session, and have plans for another trip to the West Coast for a second string of performances in LA. Otherwise, expect some big shows around the Midwest as we promote the new EP. MI: What’s your live show like? Why should people come to the show? Chris: The live set is where we truly thrive. We are all showmen who feed off the audience’s energy as well as each other. Alex: We teeter on the line of clean sophistication and raw, sweaty rock-n-roll where guitar strings hang on for dear life. Chris: There’s some drinking, jackets come off, sleeves get rolled up, amps get louder, and it’s likely Alex & Tommy pick a fight with each other on stage. And you can catch them live at their Madison EP release party on Friday, April 11th at The Frequency or at the Exclusive Company in Milwaukee on April 12th. A digital download of the new EP comes with each admission!